New image 600 x 300, fill with a colour from your tube. I used #f2bdc7, name this background. New raster layer Selections Load Selection from disk, find my Selection Middle line. Fill it with a colour of choice. New raster layer find the Selection Twirl. Fill this with a gradient made from the two colour's you have used. Copy and paste your Tube, give it a drop shadow, place it on the left hand side. 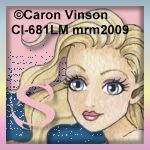 Add your name and place in on your Monica layer see my tag for ref: give it a drop shadow. New raster layer fill with the same gradient you use for your twirl. Select All Modify by 6 hit delete, give it the same drop shadow. Active the Mosaic layer, apply Effects, Texture Effects, Antique Mosaic. Active your Twirl layer Adjust Add Noise Uniform and Monochrome ticked, Noise at 45. Undo Noise, re-apply but Noise at 50, copy merge and take to AS. Open up the image you put to one said and crop by 150 X 150 using the part you wish. If you use any part of your tube PLEASE remember to add your copyright.